I’ve been asked a few times what it was like being in Nice last year. I am only writing it down now because memory is a tricky thing and if I don’t now I’m liable to forget completely or fabricate details one day. Comments are closed. This is an aide memoire and nothing more. We’d been in Nice for a couple days, after visiting my parents in Chateauneuf-les-Bains earlier in the week. On Bastille day, we’d spent the day time up in Èze mostly just wandering around, eating and having a glass of wine while admiring the view. 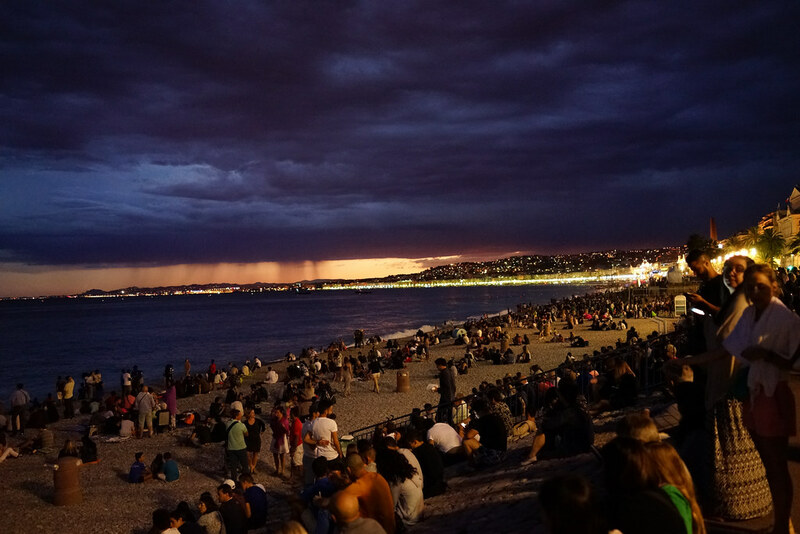 We knew there’d be fireworks for Bastille Day and headed back to Nice proper, and walked down to the seaside where many thousands of people were gathering. The were plenty of police around, in anticipation of the crowds and it hadn’t been that long since Paris’ attacks, so it was understandable. I recall commenting that the militarised police with machine guns in the town centre made me feel uncomfortable. I hate being near guns. The sun went down, the crowds increased. Irritating teenagers made us move on from our first spot, but mostly the crowd was families, lots of little kids. People sat on the wall or on the pebble beach below. We walked down the length of the sea front, towards the central area of the promenade where the largest crowds were, before eventually doubling back and stopping at a less hectic spot on the western end of the road, standing on the wall above the pebble beach. We were about here. The fireworks went off, they were really quite good. Having them over the ocean is quite spectacular, since the reflections multiply the effect and the wind was barely there. It was lovely and the mood was fantastic. Once they were done pretty much everyone began to walk back away from the sea – after the sea wall road is the old town Vielle Ville. We were going to try and find some food. Most of the people walking with us were locals, families, heading back towards the transit stops in the park that divides the older part of the town from the newer. As we walked away from the promenade and passed into the old town, we heard what I said was “probably kids with fire crackers” and carried on. It was slow going in the narrow streets with so many people moving at once. As we turned a corner towards the park areas, a very large crowd of people came running, screaming, towards us. Honestly, I’ve never seen or felt anything quite like it. I don’t even know how to describe the feeling. Instinct and adrenaline took over, and we turned and ran with them for about a half block back into the old town, back towards the sea, away from the park. I grabbed Alex by the arm and said “Stop running.” and pulled him into a doorway (I think it was the Apotheka front, because I recall the stepped decks). I said “We don’t know why these people are running, we shouldn’t run.” And we stopped and listened. I used all my French comprehension to listen to the crowds – people said there was a shooter, multiple shooters, in the park. A pair of young women asked us, in French, if we knew what was going on and I said we didn’t. We listened and waited, and heard no gun fire. We decided to start back to the hotel, this time doubling back into the old town a little, then making a beeline around the park where the people had come from before, putting down the first crowd to some misunderstanding or prank gone wrong (or maybe there really was a shooter in the park). Either way, we probably had no business to be there and we certainly didn’t want to walk into a situation. We walked past little restaurants hoping we might still find some food, but they were mostly closing up or on the phone. Something had happened, but no one seemed to know what. We made it another block or two before a second crowd charged towards us “There’s a shooter!”, this time from almost the opposite direction of the first. This time we didn’t run with them, we just stepped back into another doorway. I said “I still haven’t heard any gunshots, so I’m not sure that can be what’s happening”. Alex reminded me of what I thought were “firecrackers” earlier, but it was a day of fireworks so we didn’t know for sure either way and at this point, it was probably getting on to 15-20 minutes since we’d heard those. But we knew something was up and that no one seemed to know what. We decided we should just get back to the hotel, and made a very out of the way route trying to avoid the town centre, assuming that whatever was going on was no place we should be, but everywhere we passed small groups of people running or anxiously fleeing something. We passed people sobbing, some looking for family and friends they’d lost in the confusion and panic. A group would be walking along, and another group would run from somewhere causing the first to take off at speed with them. Cars sped over zebra crossings, not stopping to look. We were most in danger of being in a car accident or trampled in a stampede caused by panic at that point. It was tense and we felt tense but we carried on walking, making our walk longer and longer to avoid crowds as necessary, but we came across the same groups the whole way. I looked at Twitter, found tweets saying there were roaming gunmen, a bomb, an explosion. It wasn’t until we were back at the hotel with a live TV feed that we could actually filter for the truth. It had taken probably an hour and a half to get back (the sea front to our hotel would normally be less than 15 minutes). We had texts from family who’d read the same bad information on social media and thought we were in immediate danger, we had thirsty journos contacting us for our on the scene story (which they weren’t getting – we were fine and not willing to be hysterical for entertainment purposes, nor feed the speculation mill). We even had a call from Alex’s work incident team at 2am to check we were OK (we didn’t even know they knew where he was). The information vacuum felt like the most dangerous after effect. We would later know the act of terrorism had been just a few minutes long (5 minutes, apparently) and was likely over before we’d encountered the first running crowd, and was isolated to the seafront promenade. 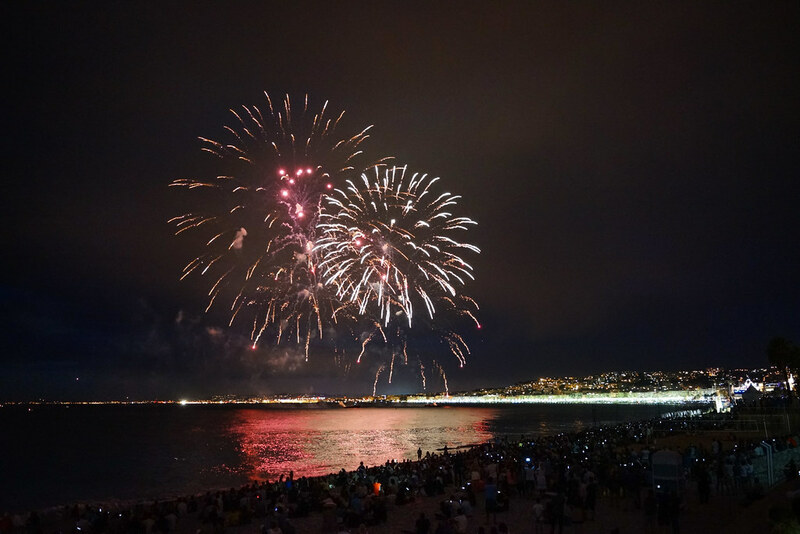 There were no roaming gunmen or bombs, no danger in the park, and the “firecrackers” we had heard were the short round of shots fired by the perpetrator and the return shots by the police. The van had driven just over a mile along the promenade, which explained why so many people initially had needed to run in so many different angles to get out of danger. Everything after that was confusion and panic. The next day, we found breakfast in the old town, and later met one of Alex’s colleagues, his wife and their two young children. They live right next to where the event had happened, and had watched the fireworks. Their children’s day event had been cancelled because people weren’t travelling into the town centre, so we had coffee outside on a sleepy street, while the kids played inside. We were sad for the those who had been hurt or killed and upset that it had happened at all, we fretted about how people would react and what changes might come, but we didn’t feel terrorised. Here’s a semi-interesting thing. 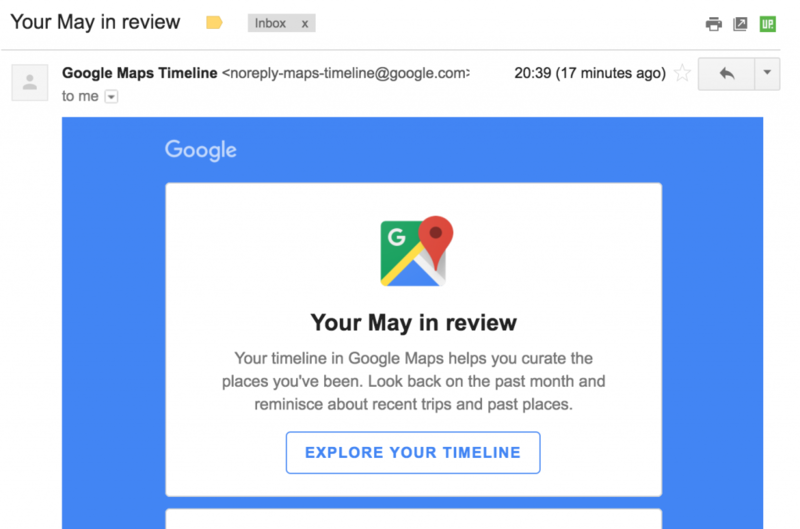 I was thinking about this and trying to get my memories correct, when I got an email from Google reminding me that I have their travel log service turned on. It’s a not very well advertised feature called “Timeline“. I wondered if it had recorded that night, and if it had, did I remember correctly? Well, I wasn’t far off. You can see where we did the first switch-back just below the corner of the park, the elongated route home, and I was roughly right about how long it took. Who needs your own fallible memories when the Big G is keeping tabs? Weird.